The B. Thomas Golisano College of Computing and Information Sciences Research Showcase is April 28. Researchers at RIT will showcase how they use computing to solve real-world problems in all aspects of life—from helping to diagnosis heart disease to preventing security breaches. 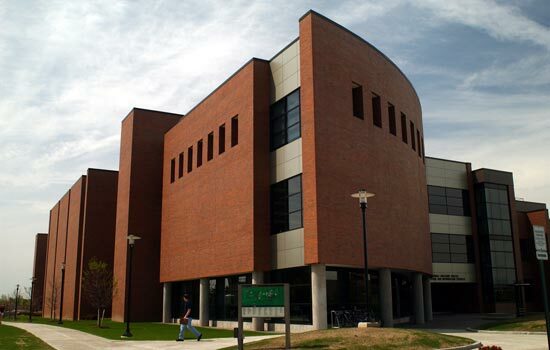 Faculty and students from RIT’s B. Thomas Golisano College of Computing and Information Sciences will exhibit their work at the GCCIS Research Showcase from 1 to 4 p.m. April 28 in the Golisano Hall atrium and auditorium, room 1400. The free event will feature speeches, posters and demos. From 1 to 3 p.m., eight presenters will give brief lightning talks with highlights on their research. From 3 to 4 p.m., more than 50 researchers will showcase posters of their work. During the event, Matthew Fluet, associate professor of computer science, will discuss his National Science Foundation-funded work with parallel functional programming languages. Matt Huenerfauth, associate professor of information sciences and technologies, will show how he’s using state-of-the-art computational linguistic technologies to benefit people who are deaf or hard-of-hearing. Lightning talks will also touch on GCCIS research in the areas of computing education, cybersecurity, health IT and machine learning. The showcase celebrates the 10th anniversary of GCCIS’s Ph.D. program in computing and information sciences. Since its inception, the doctorate program has grown to include more than 60 faculty researchers from across the RIT campus. It has also produced 26 Ph.D. graduates who are now working with academia and industry from Washington, D.C., to Silicon Valley. For more information on the GCCIS Research Showcase, go to rit.edu/gccis/gccis-research-showcase. When it comes to identifying creative ways to mitigate food waste, researchers at RIT have been managing a full plate of innovative initiatives over the last decade.